Post ONLY characters here please. Thank you. Questions or discussion about characters should be done either in the OOC thread or by PM to the GM. Please keep backgrounds between around 50 - 150 words in length. Fill out the Description and Typical Outfit sections completely in lieu of writing a description paragraph. Start with Max HP for first level. 65 points to buy stats with: 1 point per stat point. No stat under 8. Beginning money is 12 GP (refer to Coins). When buying beginning equipment you may use the core rules and the equipment emporium supplement (one of my faves). Treat listed gold prices as though they were silver. Treat silver prices as though they were copper. No pets please. You may buy riding or pack animals if you wish. Typical Outfit: A russet tunic with leather laces, dark brown leather leggings, a pair of short black boots, a wide black leather belt with a pouch on one hip and his sheathed longsword on the other. Ythmund was born of solid yeoman stock. His father is a smith and young Ythmund has spent much of his youth at the bellows feeding air into the furnace. Ythmund isn't much good at being a smith which is fortunate as he is the youngest of five sons and further has always had that hankering some people get to see what's just over the next hill. He is, however, quite good at swinging swords about in an absolute frenzy. There is general consensus amongst the villagers that young Ythmund will make a fine man at arms some day and the sooner the better. Face: jutting heavy jaw, lower teeth sometimes protrude. Typical Outfit: commoner's work clothes (farming, laborer), usually hooded. Background: Like so many others that share his heritage, Edward was orphaned after birth due to his appearance. He has lived his life working as caretaker and laborer for the church. Despite his ugly or even feral looks, Edward has a gentle soul and has a gift with the gardens and fauna of the church grounds. Recently however, it seems someone of prominence in the clergy had decided that Edward should not serve the grounds any longer citing, "he scares the parishioners with his bestial appearance". Edward is clearly not the brightest, but has the wisdom to know that he unwelcome now. Half-Orc: Darkvision 60', +1 Reactions w/ Humanoids, +1 Saves vs DeathRay or Poison. Druid: Animal Affinity (turning), Spells @ 2nd level, Only non-metal armor/shields. Adventurer's Outfit 7# 10 sp. The Pouch: When a character reaches into the pouch he or she will find a food bar about a half inch thick, two inches wide, and four inches long. The pouch will make three of these bars of food a day. They taste good but only come in one flavor. The pouches are about the same size as a normal belt pouch. The Flask: The flasks are pint sized with a screw top. They produce up to one gallon of pure cool water a day. Typical Outfit: A black leather cuirass, with expensive looking renaissance style (puffed sleeves and stuff like that) purple clothes, a white ruff & a plumed flat cap. Background: Sir Joscelin, as he always presents himself, is not the noble's son that he claims to be. After working for 2 years as a servant in a baron's manor, he decided that he had enough of this life. Stealing a few gold pieces, a dagger and some clothes, he ran away the manor without looking back. As a now wanted man, he changed his name, invented a false identity and fled far away from his native town. Joscelin is a good looking, persusive and intelligent man, which help him manage the impulsive decisions he often makes. He's got a quick temper, he's a bit of a rebel, but he's one of the most loyal friend one can have. Last edited by mTeasdale on Mon Mar 30, 2015 6:31 pm, edited 6 times in total. Typical Outfit: Long, full body black robes under-which a plain tunic and leggings. Overall, non-decrepit especially if I pull the hood over my face to conceal my looks. Background: My mother who was rather young felt that she couldn't raise me by herself so she left me to the nearest chapel of Ou. I was raised in the godesses name. One day, I witnessed a cleric cast a light spell and I was able to replicate the spell perfectly, albeit becoming very fatigued afterwards. I showed little skill is using the church's few weapons that my some of my peers held such fascination. One day, I witnessed a wizard using some sort of magical disc to carry his tomes and again I was able to replicate the ability. Although it tired me profoundly, casting spells filled me with much joy. I have set out to experience all the arcane nuances the world has to offer. Last edited by black1blade on Tue Apr 14, 2015 12:19 pm, edited 8 times in total. Guardsman outfit, studded leather armor, cloak. Elizabeth Wolfe hails from Abertawe, a small sheepherding and fishing village on the western shores of Angland. She is a sergeant in the Abertawe City Guard and considering how both her father and granpapa both are guardsmen as well, is both a well-trained and popular guard in Abertawe. She is a devout follower of Aeiou, and has followed Her teachings since she was old enough to walk to the local abbey. Recently, Elizabeth has been having strange dreams which she can't make any sense of. The dreams are peaceful but with a lot of imagery she doesn't understand, and she always awakens in a cold sweat. Last edited by Woe on Mon Apr 13, 2015 5:24 pm, edited 7 times in total. Typical Outfit: Armor and bracers with celtic knot decorations, red cloak with hood, high leather boots. Hair is bound by circlet. Background: Kynndelic's birth was seen as an omen in the fairy sidhe of Caer Aranrot, for good or bad it was not clear, for Heilyn, Kynndelic's mother, had given birth to twins, an exceptional event for elves. Kynndelic and his twin Guri were inseparable. Then -one day- Guri got killed during a hunt. The elves mourned for a time and then life got on, in the golden, endless spring under the hill. But Kynndelic could not go back to his previous life. How much time can you go on feasting and frollicking without care? One year? Ten years? A hundred? Kynndelic now felt that the elven race was wasting its gifts. So he chose to get out in the open world, see how the shorter-lived and more driven race were doing. Spear (1d6 damage): 5 sp/5 lbs. Dagger (1d4): 2 sp/1 lbs. Shortbow Arrow (20) (1d6): 2 sp/2 lbs. Ringmail (AC 14): 25sp/ 30 lbs. Medium Shield (+1 AC): 7 sp/5 lbs. Clothing, Common Outfit: 4 sp/1 lbs. -Rope, Silk (50'): 10 sp/2 lbs. -Rations, Dry (7 days): 10 sp/14 lbs. Last edited by artikid on Fri Mar 13, 2015 1:02 pm, edited 3 times in total. Eyes: Brown, a bit of a squint. Typical Outfit: A red squire’s uniform (red surcote and breeches) with pieces of studded leather armor over the top when combat seems likely. AC: 16 (Studded leather, Dex +2). 17 if using 2 weapon defense. 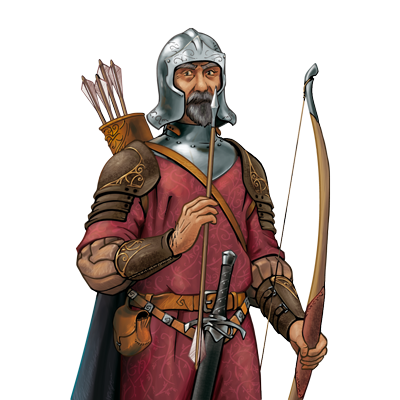 Longbow +4, 1d8 (specialized as per combat options supplement) (+5 close range). •	40 arrows 4sp no weight? 10 silver arrows in case of the werekind! Last edited by Longman on Wed Apr 15, 2015 3:27 am, edited 2 times in total. Height: 2.3 feet at shoulder. Fur color: Mottled Brown and Black.